All through Lent we reflect on the sufferings of Jesus. 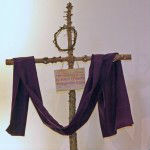 We erect a Lenten Cross made from the trunks of the Christmas trees which have decorated the Church the previous year. Symbols of Christ’s passion are placed on the tree each week. They remain in place until Easter Day when each member of the congregation is invited to bring forward a posy of flowers in celebration of Christ’s resurrection.